I am very lucky that my career and hobbies overlap so much it is a blur to distinguish between them. My active hobby is the SCA, where we dress and socialize as a medieval society. Many of us put on real armor and play a very active and extreme sport based on medieval combat. However, lets not confuse the SCA with medieval accuracy. It is a club which exists for people who want to enjoy exploring the romance and ideals of the middle ages, not necessarily the exact way things were. What I mean to say is we are very liberal in our expectations. For example, we recognize that new people (who are often students with little cash) do not always have the means to create perfect costumes any time soon. Instead of not letting them play, we make allowances and try to encourage them toward the goal of creating a more authentic ensemble. Some members just come to party with their friends -and that is cool, while others take delight in pushing the limits of in-depth research, and learning all they can about recreating the look of the middle ages. I fall into both categories. Randy has indeed pushed the limits of in-depth research. He is both patient and fearless in his quest for knowledge of the old ways. 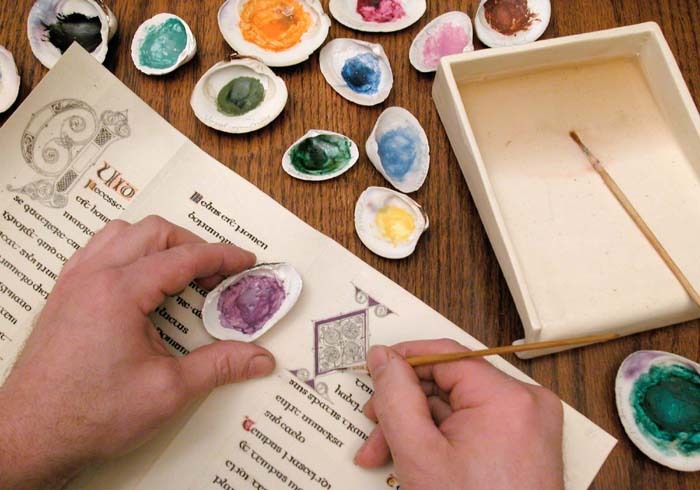 He makes his own parchment and some of the colors he uses for illumination. He also makes and sells reproduction tools. Late 14th- early 15th c. French reproduction Brush Tray with decorative glaze, for Tempera painting. Visit RandyAsplund.com to see samples of his work and process which he generously shares it online. wow!!! 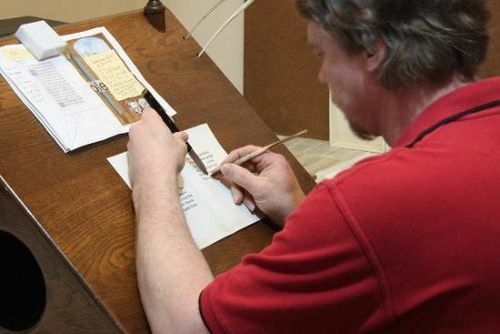 he is brilliant did you have a look at the wax tablet & stylus? Wow! this man knows about getting the details "right"! i've just "found" randy, and have to say that local sca friends also are meticulous in their handwork as they make "stuff" relating to their hobby. randy's work is exquisite. thanks for profiling him!